"I personally consider this just a continuation of my service to my country," says Tammy Duckworth, in her second bid for an Illinois congressional seat. WASHINGTON — One flew an A-10 Warthog over Iraq and Afghanistan. Another was part of the 29th Infantry Brigade’s medical operations near Baghdad. A third lost both legs and partial use of an arm in a rocket-propelled grenade attack in Iraq. All are war veterans aiming to serve in Congress. All reflect an evolving U.S. military. All are female. After more than a decade of wars in Iraq and Afghanistan, dozens of military veterans — Republicans and Democrats — are running for Congress this election year as voters have shown a fresh enthusiasm for candidates with no elected experience. This year, as the military has opened more jobs to women closer to the front lines, several of those veterans are females with battlefield scars and pioneering accomplishments. Tammy Duckworth was a captain in the Army National Guard, sent to Iraq in 2004 and injured in November of that year when the Black Hawk helicopter she was co-piloting was struck but landed safely. In her second bid for Congress, the Democrat and former assistant secretary at Veterans Affairs hopes to wrest a northern Illinois seat from Republican Rep. Joe Walsh, an outspoken tea party freshman whose comments have stirred controversy. Republicans and Democrats consider the 44-year-old Duckworth the favorite. Tulsi Gabbard was a specialist with the medical unit of the 29th Brigade of the Army National Guard and a military police platoon leader who helped train the Kuwaiti national guard’s counterterrorism unit. The 31-year-old stunned Hawaii’s political establishment earlier this month with a come-from-behind win in the Democratic primary. The former Honolulu City councilwoman is favored in the Democratic-leaning district in November. Martha McSally, an Air Force Academy graduate, is the first women to fly a fighter aircraft in combat and the first to command a fighter squadron. She is expected to clinch the Republican nomination in Arizona’s Aug. 28 primary and likely will face Democratic Rep. Ron Barber in a redrawn district once represented by Gabrielle Giffords. That expected match-up is considered a toss-up. McSally quickly points out that the oath for a military officer — to support and defend the Constitution against all enemies, foreign and domestic — is the same for a member of Congress. Forty years ago, military service was a standard line on nearly every lawmakers’ biography as generations of veterans who fought in World War II, Korea and Vietnam won seats in Congress. In 1969-71, 398 veterans served in the House and 69 in the Senate, according to the Congressional Research Service. The shift to the all-volunteer force in 1973 sent those numbers plummeting and few from the military joined the congressional ranks. Today, lawmakers with service in the Army, Navy, Air Force, Marine Corps and the National Guard and Reserves total 88 in the House and 24 in the Senate, among them decorated World War II veteran Sen. Daniel Inouye, D-Hawaii, and Sen. John McCain, R-Ariz., a former Navy pilot and Vietnam prisoner of war. The numbers amount to about 22 percent of the 535-member House and Senate. During the more than 10 years of conflict in Iraq and Afghanistan, women by necessity worked as medics, military police and intelligence officers and were attached to battalions of about 800 soldiers even though they couldn’t be formally assigned to the unit. Many flew helicopters supporting the battalion that went out on patrol or were medics. New military rules earlier this year formally opened these jobs at the battalion level to women though females are still banned from serving as infantry, armor and special operations forces. Of the approximately 1.4 million military personnel, 207,308 are women, including 37,807 officers, according to Pentagon statistics. Seth Lynn, director of the Center for Second Service at George Washington University, which trains veterans to run for elective office, said those female war veterans smash the stereotypes. At least three women with military experience have served or are serving in Congress. Heather Wilson, an Air Force Academy graduate who was with the service in the 1980s, was a House member from New Mexico and is seeking the open Senate seat this year. Catherine Small Long, who was with the U.S. Navy in World War II, represented Louisiana in the House in 1985-87. Freshman Rep. Sandy Adams of Florida worked as an aircraft electrician with the Air Force from 1974-75. She lost in Florida’s primary on Tuesday to fellow Republican Rep. John Mica. Duckworth said female war veterans in Congress will have a unique voice in Washington. 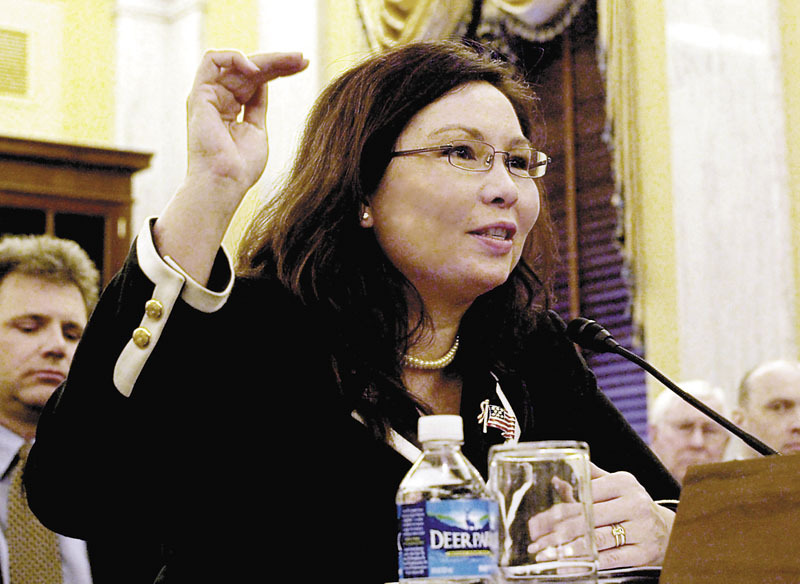 Duckworth said she will continue to push for the military to open more jobs to women. McSally challenged the military establishment, forcing it to reverse a policy that required U.S. servicewomen to wear a Muslim Abaya and headscarf when they were based in Saudi Arabia. Her challenge became a provision in Congress’ defense bill and the policy was overturned in December 2002.